Pure elegance. 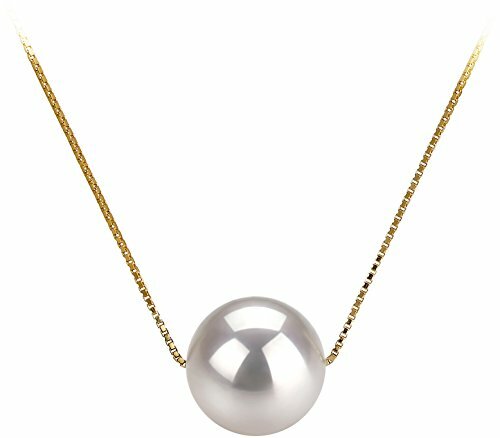 A single large Akoya cultured pearl on a beautiful yellow gold chain - just beautiful! Investment grade quality and a lifetime of enjoyment - only offered by Japanese Akoya Cultured Pearls - grown in the cold waters off the coast of Japan where the cold water slows down the growing process - resulting in shine and luster that cannot be duplicated. All of our Akoya cultured pearls are certified by the Japan Pearl Exporters Association to ensure the strictest of standards. This pendant showcases one white 8 to 9mm Japanese Akoya cultured pearl . The cultured pearl is an overall AAA - combining breathtaking mirror-like AAAA luster, perfect (and very rare) AAAA shape and AAA body. And its noteworthy that this pendant is AAA quality, the luster of this pendant is of the higher AAAA grade and the shape is AAAA which is also higher than the overall grade. Your pendant will be carefully packed and shipped to you in an elegant velvet lined box and accompanied by lots of free extras. And, if you choose, we would be delighted to gift wrap your pendant and turn this pendant into an unforgettable gift. Included FREE with your cultured pearls pendant is an Appraisal Certificate prepared by a Pearl Expert describing in detail your pendant size, color and body shape. A color picture of your pendant is shown on each certificate to ensure carefree insurance claims should those ever arise. It is a wonderful keepsake that shows you truly care. Create a WOW! Experience with a FREE matching gift box. Our boxes are exclusively designed for PearlsOnly to gently hold your cultured pearl pendant during shipping and also to be breathtaking when your cultured pearl pendant is unwrapped and opened. With a focus on detail and elegance, the overall packaging from outside wrapping to inside, creates an unforgettable opening experience. Easily care for your cultured pearls pendant, with a FREE silky storage pouch to protect your cultured pearls pendant when you are not wearing it. Although cultured pearls are very easy to take care off, we do include a FREE Pearl Care Card, so that you can easily know how to best take care of your cultured pearls pendant to keeps its value and beauty.